Free racing arcade for speed and adrenalin lovers! 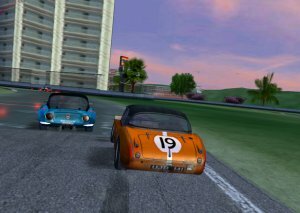 Try yourself as a GT class racing cars pilot. 17 most famous courses of the world are waiting for you!The morning half-hour WarmUp is finished, and while Formula I racers are preparing to the main start, "special events" are held on the track. In Italy it's "Renault-Spiders", and in Austria it's "Porsche" bolids. Realistic physics of this free racing lets you feel nuances of driving in various weather conditions. After driving cars is mastered you may take the risk and try your professionalism and guts in a championship, where a minor fault causes flying out off the track and loosing precious seconds and victory.Download free "Lost Roads Races" and receive an ocean of adrenalin!